Ideal for first time buyers or investors, this 2 bed first floor flat in Ingleton is well-priced to reflect the work required. With views over the riverside picnic area, parking and low ground rent, the property is available with no chain and viewing is essential in order to appreciate potential. Ideal for first time buyers or investors, this 2 bed first floor flat in Ingleton is well-priced to reflect the scope for improvement. With views over the riverside picnic area, parking and low ground rent, the property is available with no chain and viewing is essential in order to appreciate the potential to add value and create a comfortable, low maintenance home or let. The property has previously been a residential let and would generate a yield of 5 to 6% for a new buy-to-let owner. The flat would be equally suitable as a "lock up and leave" home for visitors to the Dales, or for staff accommodation. The accommodation comprises, ground floor entrance hall, stairs to landing, kitchen, bathroom, living room, double and single bedroom. Outside there is a bin store and small front garden. The flats have a private car park with 1 allocated parking space per flat and 2 for visitors. The property overlooks the pleasant riverside picnic area and is close to the popular open air swimming pool. 23 Thacking Lane is well placed for all the amenities that Ingleton has to offer. The lease is for 999 years from 1982 and is subject to a low annual ground rent of £20 per year, paid 1st June. No pets allowed without prior written permission of the management company. Ingleton is a popular village - a gateway to the spectacular Yorkshire Dales National Park. With bars, pubs and shops, the village is well known for its stunning waterfalls walk. Ingleton has a primary school and is in the catchment area for highly regarded secondary school education at QES, Kirkby Lonsdale and Settle College. As well as the Dales, the Forest of Bowland AONB is close at hand and the Lake District can be reached within under an hour. Trains can be caught at Bentham. Lancaster and the M6 are half an hour by car. The popular market towns of Settle and Kirkby Lonsdale are a short drive away and both have Booths supermarkets. The property is on mains water, drainage, electricity and has gas central heating. ENTRANCE HALL Ground floor entrance hall with single glazed front door and side window. Coat hooks. Shelving. Carpeted stairs to landing on first floor. LANDING Landing providing access to all accommodation. Cupboard housing gas central heating boiler. Loft access. Carpet. Radiator. KITCHEN 7' 8" x 6' 5" (2.36m x 1.97m) UPVC double glazed window to the rear aspect. Range of fitted wall and base mounted units. Stainless steel sink and drainer. Vinyl flooring. BATHROOM 4' 5" x 8' 0" (1.37m x 2.46m) UPVC double glazed window with obscured glazing to the rear aspect. WC. Bath with shower over. Wash hand basin. Vinyl flooring. Radiator. LIVING ROOM 13' 1" x 10' 1" (3.99m x 3.09m) Good-sized living room with UPVC double glazed window providing views to riverside area. Carpet. Radiator. NB. Gas fire has been de-commissioned. 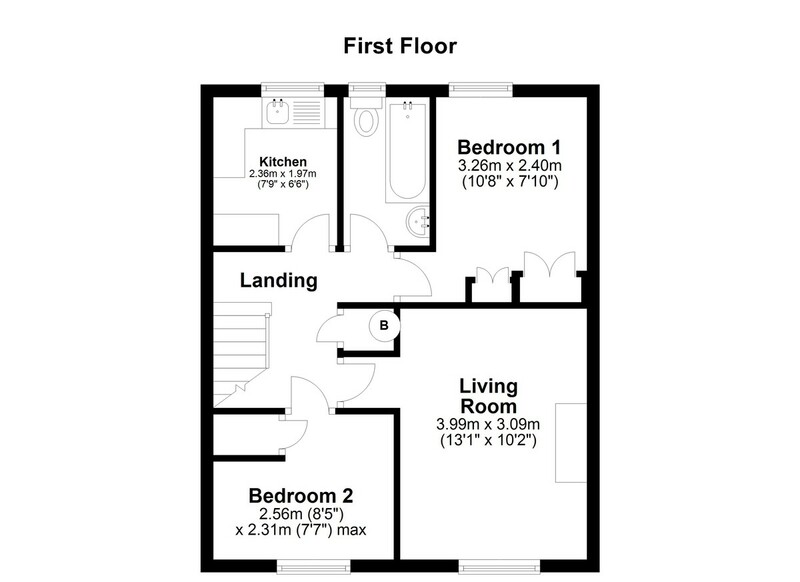 BEROOM ONE 10' 8" x 7' 10" (3.26m x 2.40m) Double bedroom with UPVC double glazed window to the rear aspect. Built in wardrobe and cupboard. Carpet. Radiator. BEDROOM TWO 8' 4" x 7' 6" (2.56m x 2.31m) Max. Single bedroom with UPVC double glazed window to the riverside picnic area. Large built in storage cupboard. Carpet. Radiator. OUTSIDE The private car park is accessed from Thacking Lane and each flat has a parking space. There are 2 visitor spaces. Steps lead down from the car park to a walkway to the front access to each flat, with the riverside picnic area accessible by continuing further along the path. Steps lead up to the front entrance, with a small sloping garden laid to lawn, with mature trees. The flat has a bin store.